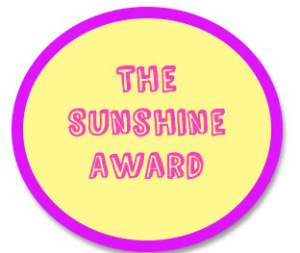 I have been awarded the Sunshine Blog Award. And now, before we discuss that further, I’m going to–in true Devon style–get all pensive about it. From my hasty research, I conclude that there are two kids of blog awards. The first is backed by some sort of organization of some kind. That can be as thrown-together as a New York online group of disenfranchised bloggers (think Ugly Betty‘s Blobbies) or as backed as the Bloggies or BOBs. Either way, these awards are begun with nominations and ended with some panel of person(s) choosing from some number of blogs to endow a specific amount with award(s). The other form of blog award would be better called a chain compliment. This is where the Sunshine Award comes in. For these “awards,” a previously-endowed blogger passes the award onto another set of bloggers. Those bloggers, should they choose to accept, have to jump through some hoops, like posting the logo, answering questions, and most definitely passing the award on to others. Like I said, very much like a chain compliment. Because the truth is, a fellow blogger has to choose you in order to win, but there is no judgement phase beyond that. One big, happy nomination party that lasts forever? You can even find websites online where you can generate “awards” for blogs that you like. Just from you. The all-bestowing. Let’s consider what this second group of “awards” would do for you. First, they involve warm, fuzzy feelings. They network you with other bloggers. They give you the chance of increasing perceived success and validity, resulting in increased traffic and increased income. Isn’t that the goal? The deal is, and let’s be honest, the onus is on the informationally-gifted (that would be the reader) for deciphering one award from another. There’s the Most Improved in the Echo Grove Camp B Band and then there’s an Oscar. Which one would you rather have? More importantly, which one do you crown with more force? Now let’s consider how they might hurt. I have been struggling with this one a lot lately, also considering writing awards (and I will be blogging about that very soon, “Weighing In On ‘Vanity Awards'”). I suppose that it might hurt your credibility if you were linked with shabby awards and un-earned laurels. But with whom? Mostly, I think, we would be talking about circles of especially cool and snobby people. If I were to walk down the street and tell 100 people I won a Sunshine Blog Award, I’m going to very ridiculously claim that the vast majority of them would say “Congratulations!” and even get that envious gleam in their eye. Only a few would heighten the level of their chin and breathe down at me, “What is that?” But I like to be cool, and I like everyone to like me. And like my book. Ah, well. Now let’s decide whether or not we can morally accept a chain compliment award. I am going to say sure, as long as you are not intentionally misleading people by making the Sunshine logo look just like a Caldecott Award. And no making up stats. Just use it for what it is: a way to reach out to the blogging community, checking out the blogs you want to nominate and waiting for your nominees to return the favor of surfing your site. A couple tweets can’t be all bad. I would first like to thank Steph Jones over at The Road to Creativity for the nomination. List ten things about yourself. Nominate ten bloggers, complete with links, and comment on their blogs letting them know of the nomination. I galloped around the Pyramids of Giza on a camel named Charlie Brown, wearing nursing scrubs. I am going to Moldova soon, to help run a camp for teens and have the anniversary trip of a lifetime. Camping. I can crack my right ankle on command. And while we’re on the subject, I regularly see a chiropractor. I love good, dark chocolate, but never milk chocolate. And I don’t like melons. But I love cauliflower. I really enjoy cut flowers, but I can’t keep a plant alive for anything. My strongest sense is my sense of smell. And maybe my intuition. I convinced my parents to let me be an exchange student to Paris when I was eleven. I am part Cherokee. Or Cree. At any rate, this isn’t all British. One of my passions is exposing and obliterating human trafficking, as well as freeing and rehabilitating victims. I have been involved with Stop Child Trafficking Now, Freedom Firm, and other local organizations. Thanks so much, Devon! I’m honored.